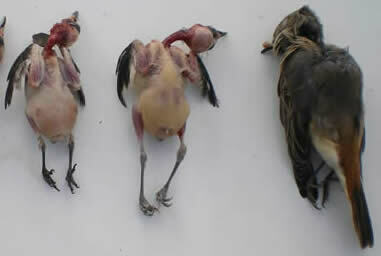 Honeyguide supports South African Bird Atlas. Scroll down to 'latest news' on the SABAP2 website or go straight to the full story here. What's the butterfly on the right? It's a slightly trick question. Click on the picture to read more. Next chance to see something pretty similar to this (perhaps a hint?) will be in Madeira in February. Staying in Madeira, Europe's rarest breeding seabird, once thought to be extinct, is the Zino's Petrel or freira. 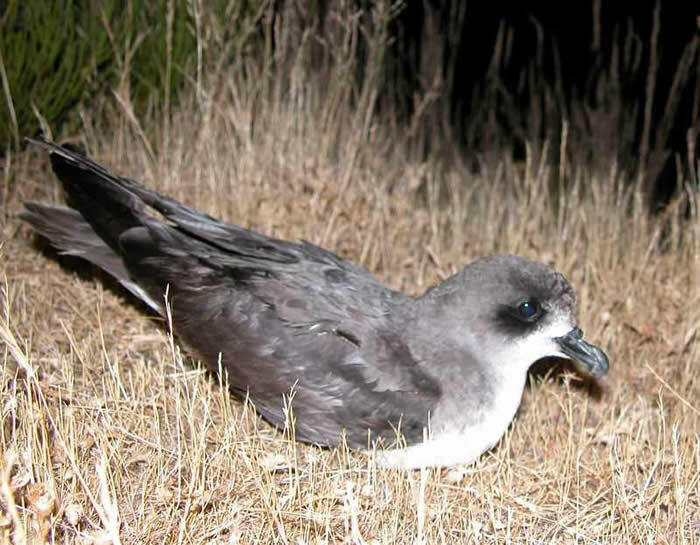 Endemic to Madeira, the first-ever documented at-sea record of Zino’s Petrel was this April. Read more on the website of our holiday's hosts, Hugo and Catarina of Madeira Wind Birds. Check out our Calendar to find out which holidays still have places. I was in Poland in late September, and very good it was too. If you'd like to read my recce report, click here. Alternatively, start by reading about Białowieża and beavers. We have just two twin rooms remaining on the holiday. Have you ever seen a nun's fart? We asked Honeyguide leader Chris Gibson for his top 10 reasons for visiting Menorca. See his answers here. Has your brochure arrived? It should have, but with postal problems it's tough to be sure. If it hasn't, please get in touch for another. We are very happy to accept bookings from a completed booking form scanned and emailed with a deposit paid by bank transfer. With a postal strike looming, the shape of things to come? Bookings are coming in steadily but places remain on most holidays (exceptions are Extremadura, Central Portugal and Eastern Greece). If in doubt, please phone or email. Honeyguide's brochure for 2010 has just been posted and this website updated so we're up and running for next year's programme. There's a list with dates on our calendar. Several Honeyguiders are already pencilled in. You'll see there are new holidays in Central Portugal, Poland and Kruger National Park in South Africa. The brochure is in colour throughout for the first time, reflecting nature's colour as we do already in our recent holiday reports and on this website. I hope you enjoy browsing the brochure, updated website, or both. Credit for the new brochure design goes to David Abery at our printers, Gowise, which is just a short (though very uphill!) cycle ride away from the Honeyguide office. It has the an FSC recycled paper logo on the back. It's always been printed on recycled paper but Gowise have gone through some extra hoops to be able to use the FSC logo. Read more here. The brochure comes in a plastic wrap, oxo-degradable film for the first time this year. This decays in landfill much quicker than standard poly bags. I've been asking for a more environmentally-friendly outer for many years and happily at last this is getting easier, helped by others like local authorities and wildlife trusts requesting it, according to Cavalier, Honeyguide's mailing house at Rackheath just outside Norwich. In Extremadura, click here to see SEO's web pages (in English) about current threats to the wildlife - with a request to sign a petition. The Wildlife Outreach Network in Essex is kindly supporting the Honeyguide Wildlife Charitable Trust this coming year again, and will be topping up our conservation donations to projects in Portugal, the Spanish Pyrenees, Bulgaria and the French Pyrenees. ATOL Protection Contributions (APCs) will rise from £1 per person to £2.50 from 1 October 2009. The Air Travel Organisers Licence (ATOL) system provides financial protection to those taking flight-inclusive package holidays overseas and is operated by the Civil Aviation Authority (CAA). It ensures that in the event of a tour operator becoming insolvent, consumers already abroad can complete their holidays and be returned to the UK and those who have paid for their holidays but have not yet departed will receive a full refund. Honeyguide holds an ATOL. The APC was introduced in April 2008 to raise funds for the Air Travel Trust Fund (ATTF), which meets the insolvency protection costs of the ATOL scheme. The failure of XL leisure group in September 2008 and the effects of the recession have caused serious financial difficulties for the ATTF. Following a consultation by the CAA earlier this year, the APC paid by travel companies to the ATTF will rise to £2.50 per passenger. This sum will be included within the price of your Honeyguide holiday. Comment: on the one hand, it is irritating that travellers with generally sound small operators are caught by a problem created by the collapse of one large business. On the other hand, it remains a relatively small sum per person to support the robust and valuable ATOL scheme. But expect to see - and take with a pinch of salt - cries from big boys in the travel industry saying this change will bring travel its knees. I don't think so! I have recently returned from the French Pyrenees and thought I'd share with you these photos of 'herptiles' that were new to me. 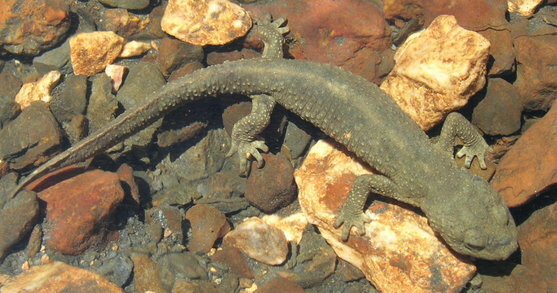 The Pyrenean brook newt (right) was in a brook high on the Troumousse plateau; we saw Pyrenean rock lizard (below) in a couple of higher areas. Bee orchids saved from strimming: I was cycling past Norwich City football ground earlier this week and noticed a bee orchid growing outside the Big Yellow Self Storage warehouse opposite. There was also a guy with a strimmer and another with a lawn mower. I had a chat, we found four bee orchids all told, and with help of the store’s assistant manager left the orchids uncut. Next step, ideally, is for the grass to be cut less frequently, in late July like a meadow, so the ox-eye daisies and ragged robin have a better chance. The story was in the Eastern Daily Press today (11 June) - read it here. Vote for Honeyguide! Many of you kindly did and our website topped the poll run by www.easily.co.uk with 66 - just over half - of 131 votes cast. Confirmation of our win is here. I'm enjoying the iPod that I won. Easily said: "This beautiful site is clear, very well illustrated, pleasant to browse and very accurate and up to date about wildlife and natural holidays. It has all the ingredients to be an example of any touristy website." It's a bumper year for painted ladies. Read more >. A naturalist of distinction. 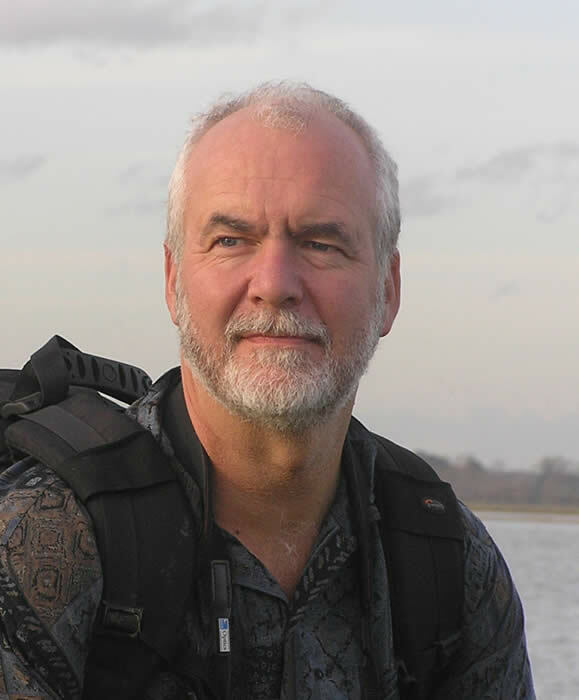 Any Honeyguider who has travelled with Chris Gibson knows this is an apt description, but now it's official as Chris was presented with a prestigious Naturalist Award on 9 May by David Bellamy for the British Naturalists’ Association. This award is given annually to ‘a field naturalist of distinction’. Chris was with Honeyguide's group on Menorca, which discovered a new breeding bird for the island: a brood of red-crested pochards at the seasonal wetland at Tirant. Honeyguide is on GOB Menorca's website here. It's not every month that I see three 'lifers', new birds for me in Europe, yet I did in April. Though you could argue that two of those in Algarve don't really count. Imagine the group's surprise at the Lagoa dos Salgados marsh at Pêra when we realised that the four ibises we were watching were bald ibises (see picture, right), one of the world's rarest and most threatened birds. Then, as they got closer and tamer, showing three leg rings each and, with careful observation, satellite transmittors too. Then imagine the sound of pennies dropping as we recalled that there is a reintroduction project in Andalucia and that these birds had simply come over the border from Spain into Portugal. The crested (or red-knobbed) coot with a white neck collar at the Ria Formosa Natural Park was similarly from a Spanish captive-breeding and release scheme. However the tiny Baillon's crake almost at our feet at Agia reservoir on Crete was certainly a wild bird. 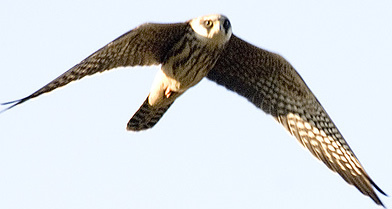 Our Algarve holiday included the usual donation to Portuguese BirdLife partner SPEA. For coverage of this story in the Algarve Resident (the online version of an newspaper in English), click here. For pictures of the bald ibises (also see right) and much more, the Algarve holiday report is already on the report page of Honeyguide's website. Another proud dad moment: Alex's Under Nines football team had lost every one of their matches so far, but in their final match of the season, away at Costessey, at long long last they all battled hard and won 1-2. There was much shouting, excitement, tears of joy - and the boys were quite pleased too. Match report here. William remains a key member of the Under Sixes at Hillside Rovers. Flowers of Crete is a new organisation which aims "to bring the rich and diverse flora of the island to a wider audience." It has a cracking website; if you like Cretan flowers, well worth a look – click on the picture below. Last October, Kuşkor in North Cyprus undertook a study into illegal trapping on the Karpaz peninsula. Read the report here. Its conclusion: "Illegal bird trapping is far more widespread than previously believed but is as yet not as commercialised as the activity in the South." The study was partly funded by Honeyguide. This support continues in the absence of a holiday through the good offices of Roger Jordan and friends in the Wildlife Outreach Network: we have just sent a further £200 to Kuşkor. Malcolm and Helen Crowder, trustees of the Honeyguide Wildlife Charitable Trust, have just completed the paperwork for our annual claim for Gift Aid on your conservation contributions, which this year will top £1,000 for the first time. This is partly thanks to the increased conservation contribution this year of £35 person per holiday, partly the continuing high proportion of Honeyguiders who are eligible and mark the box on the booking form and underpinned by the high level of bookings across all holidays. Our running total for donations since 1991 is £55,836. We don't normally do discounting, but for the Danube Delta we offer a £50 discount for anyone returning. It's a thank you prompted and funded by our hosts, Ibis, taken up by one Honeyguider last year and due to another this year. We could do with a few more on this holiday this year so in the hope of tempting back more, Honeyguide will double the returners' discount to £100. If you've been before, you'll need no reminders of the incredible wildlife of the Delta. For anyone else, have a look at some Danube Delta pictures here and you will be tempted! Last week I was in eastern Alentejo based near the beautiful town of Mértola, where the nesting lesser kestrels had already arrived, along with many spring migrants. I was the guest of Mértola's tourism office, which is hoping to boost nature tourism and was picking my brains. It's a lovely area, reminiscent of Extremadura in some ways but with its own character. Excellent food, too. The nature highlight, easily topping several great bustards, was a group of four great spotted cuckoos, calling and excitedly dashing around close to. This part of Portugal has potential for a future holiday too, maybe a small group with one minibus and one leader, which I hope to work on. In February, the Honeyguide Wildlife Charitable Trust gave £500 to the Freira Conservation Project in Madeira, raised by the Madeira holiday and topped up by an anonymous donation. Dr Frank Zino met the group and explained how the money is spent on dataloggers that track the migration and feeding of Zino's petrel or freira, this rarest of all seabirds. Thank you to Sea Palling WI for a £30 donation to Honeyguide's charity following a talk there earlier this week. BirdLife International has an excellent e-newsletter. You can subscribe (free) to BirdLife Europe e-news today and receive all the latest updates on its work on EU nature policy and conservation issues here. 'Ethical publishing, supporting conservation'. That's the strapline for WILDGuides, which was created in 2000 as a non-profit making publishing organisation with a commitment to supporting wildlife conservation. We're pleased to give WILDGuides a plug as the company has values similar to Honeyguide and many good products. These include the excellent Crossbill guides to several glorious parts of Europe including Extremadura, the Camargue and Biebrza marshes in Poland. Just out is the new Crossbill guide to the Cévennes. Click on the picture or here to read more. For a second - but last - time, the Honeyguide brochure was sent to former travellers with Gullivers Natural History Holidays, by kind arrangement with Bob and Jacky Gulliver. 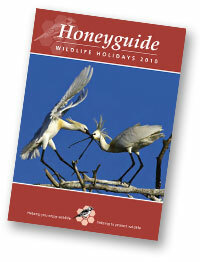 If Gullivers travellers would like to keep receiving the Honeyguide brochure, please contact us. We have a new web page about red and black bugs - click here or on the picture. ATOL Protection Contributions will rise from £1 per person to £2.50. This sum will be included within the price of your Honeyguide holiday. Bee orchid: Norwich City football ground is in the background. Iberian orchids: trips in Spain and Portugal reminded me that the names of orchids change over time and it can get quite confusing. What's this orchid, recently added to our Iberian orchids webpage? Click on Iberian orchids or the picture below to find out.